Twenty-one-year-old Butler men’s basketball center Joey Brunk has just checked into the game, and the cheers from the 9,100 fans packing Hinkle Fieldhouse are thunderous. Brunk pushes a soft, loose wave of what Twitter users have called the “golden mane” and “the best hair in college basketball” away from his face, a grin peeking through his Matthew McConaughey-inspired beard and mustache, and steps to the line. Swishes the free throw. … and heads back to his dorm, where he’ll strip off his size-17 sneakers, maybe read some poetry or a JFK biography (“He’s my favorite president”) before curling his 6-11 frame into a bed not made for a man who could nearly stand head to head with a small adult elephant. In the morning, it’ll be time to teach poetry to second-graders. Brunk, an Elementary Education major and aspiring teacher, spent last semester student teaching in a second-grade class at the Butler University Laboratory School on Wednesdays. His first full-class lesson was an introduction to emotion poetry. Brunk says there aren’t a lot of men in elementary education—last semester, he was one of only two guys in his elementary-education class. But as he rests his fist on his chin in a pose reminiscent of Rodin’s The Thinker sculpture, the mid-morning sunlight streaming into Hinkle Fieldhouse streaking his wavy hair, it isn’t hard to believe the hard-charging center whom Butler Director of Basketball Operations Brandon Crone calls a “gentle giant” is a poetry aficionado. No one in Brunk’s immediate family is a teacher, but after volunteering in a fifth-grade class at Southport Elementary School a few days per week his senior year of high school, he was sold. “I wanted the kids to be able to have a positive role model,” he says. It’s a role Brunk also tries to play for his younger brother, Johnny, a sophomore guard at Roncalli High School, about 20 minutes south of Butler. Being able to stay close to Johnny was one of the reasons Brunk, a four-star prospect out of Southport in 2016, chose Butler over offers from a bevy of Big Ten schools, including Indiana and Purdue. Which meant his Friday nights were never exactly, umm, wild. But supporting his younger brother has never been a chore for the Butler big man. “He was there to support me, so I want to support him,” Brunk says. So it was never a question for Brunk to forego the remainder of his first-year season to spend time with his dad after Joe Brunk was diagnosed with brain cancer in November 2016. Brunk has been to the Indianapolis Zoo no fewer than 500 times. He would go with his family once or twice a week from age 2 on, always wanting to look at the same things—the lions, tigers, and his current favorite animal, the red panda. And the animal-lover also says his parents enabled a fearsome Zoobooks addiction. “They paid for a monthly subscription, and it went on so long that I’d have three copies of the exact same issue,” he says. He honors his dad by visiting a local zoo with Butler play-by-play radio announcer Mark Minner whenever the team travels for a tournament. It’s a way for Brunk to keep his hero with him. Brunk and his dad, a two-time NAIA All-American at Hanover College, bonded over basketball from the beginning. They attended games at Hinkle Fieldhouse together, and Joe Brunk was his son’s first AAU coach. “He was my biggest critic—and my biggest fan,” Joey Brunk says. His dad would pick him up from middle school every day and drive him to the gym for workouts, a dedication that paid off when Brunk was a Top 100 recruit and one of the three finalists for the statewide IndyStar Mr. Basketball award as a high school senior. Joe Brunk was there to watch Joey’s Southport team beat Ben Davis 60-57 for the sectional championship during Brunk’s senior year—and Joey hoped he’d one day get to watch Butler win an NCAA Championship. Then, in November 2016, his dad was hospitalized while visiting friends in Las Vegas. The diagnosis? A brain tumor. Brunk stayed at his dad’s side in Southport for the next six months, foregoing the remainder of his first-year season to spend the last moments of his dad’s life with his hero. Joe Brunk died April 15, 2017, at age 56. But, true to his dad’s mantra of living with passion, Brunk made a vow: He wouldn’t be depressed. He’d be the Energizer Bunny. Drop in on a Hinkle Fieldhouse practice, and you’d be hard-pressed to find a happier guy than Brunk. He wears his dad’s No. 50 jersey, another reminder of the man who helped him achieve his dream of playing Division I basketball. Brunk doubled down on his dedication to the sport this summer, using the offseason to transform his body with as many as four workouts each day, ranging from hot yoga to shooting with his brother at Roncalli. He dropped 10 pounds, from 240 to 230, and increased his maximum bench press from 230 to 260 pounds. And it’s paid off: He’s averaging 8.6 points per game this season, compared to last year’s 1.3. His average rebounds per game are up to 4.4 from 1.8. And his average minutes per game have quadrupled, from five to 20. The NCAA granted Brunk an additional season, awarding him a hardship waiver for his first year, as he only played in seven games before stepping away to be with his dad. That means he’s a redshirt sophomore this season, with two years of eligibility remaining. Crone says that, despite his dad’s death, nothing about Brunk’s personality has changed. The Butler Men's Basketball center is dedicated to achieving his dream and helping others do the same. Butler Theatre closes its 2017–2018 season with The Little Prince, Antoine de Saint-Exupery's tale of love and loyalty, April 11-22 in the Lilly Hall Studio Theatre 168. Tickets are $5-$15. They are available online at ButlerArtsCenter.org or at the box office before each performance. The Little Prince, a childhood favorite, is the story of a pilot stranded in the desert who meets an enigmatic young prince who has recently fallen from the sky. Audience members can let their imagination take flight in an adventure that celebrates fantasy and friendship. The final show of the season runs April 11-22. 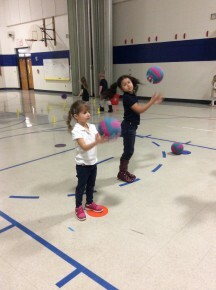 Jill B. Allen ’13 needed physical education equipment and resources for her Movement Studio classroom at the Butler Lab School and, thanks to the participants in the NFL PLAY 60 DonorsChoose.org Showdown, she’s getting it. Allen’s class will receive an array of volleyballs, basketballs, soccer balls and other gear after her project, called “Help Us Get Moving in Class and at Recess!,” was featured in the NFL/DonorsChoose competition. The NFL Play 60 Rush initiative is a weekly contest that pits two deserving youth health and fitness projects from the corresponding cities who play on Monday Night Football against each other each week. Fans vote for the winner. Allen’s project won against a school from Queens, New York, which will receive 50 percent of the money it requested. Mindy Welch, Coordinator of the College of Education’s Human Movement and Health Science Education (HMHSE) program, said Allen has established “a remarkable impact” at the Lab School. Allen was one of six Butler juniors who were in an inaugural physical education practicum at the Lab School in the spring 2012. HMHSE students and faculty have provided the school’s only movement education since then, until Allen was hired this fall. Welch, who is on sabbatical this fall, is working with Allen to develop the Movement Studio curriculum. If you see a polar bear on Butler’s campus, don’t be alarmed. In fact, be encouraged. Junior Butler Ambassadors for Special Olympics (BASO) co-chair Alyssa Del Priore dressed as the Polar Plunge polar bear mascot on Wednesday, January 17—better known as “super sign-up day”—to encourage her fellow students to take the Polar Plunge. During Butler's ninth annual Polar Plunge, which will take place on February 10 at 9:00 AM outside the Health and Recreation Center, participants will jump into a pool of freezing water to benefit the Washington Township chapter of Special Olympics. The goal is to raise $60,000 to help support sports training and athletic competition for more than 13,000 Special Olympics Indiana athletes. BASO is about 25 percent of the way toward that goal. The Polar Plunge is now 16 years old. Most of the events take place on college campuses "because there is a big support system within campuses and it promotes inclusivity and raises money for a great cause,” Del Priore said. But Butler's Polar Plunge is not only for Butler students. Although jumping into the body of water will be the main attraction, there will also be various activities and games that will bring the Butler community and athletes of the Special Olympics together. Don't be afraid to ask. Most people will be willing to donate once they learn about the cause. The annual Polar Plunge takes place February 10.